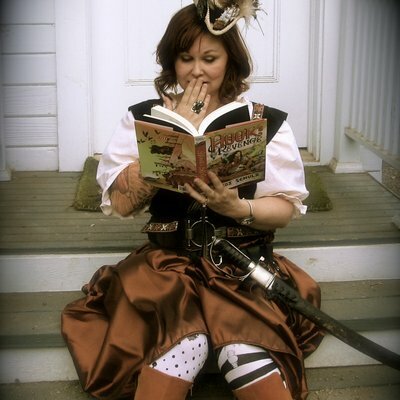 Heidi Schulz is a writer, reader, and giraffe suspicioner. She lives in Salem, Oregon with her husband, co-captaining a crew made of their teen daughter, a terrible little dog, and five irascible chickens. Her debut novel for middle grade readers, HOOK’S REVENGE, will be published by Disney•Hyperion on September 16, 2014. A sequel, HOOK’S REVENGE: THE PIRATE CODE, will follow in fall 2015. Bloomsbury Kids will publish her picture book debut, GIRAFFES RUIN EVERYTHING, in 2016. Hi Liza! Thank you for hosting me today! I thought I could talk to your readers a little bit about fairies—specifically the fairies in Hook’s Revenge. Sound good? I’m sure most of you are familiar with Peter Pan’s fairy, Tinker Bell. Remember in Peter Pan, how Tink almost got Wendy killed because she was so jealous over Peter? Well, I’m sorry to say she hasn’t changed much by the time Jocelyn gets to the Neverland. But she’s not the only lovesick fairy you’ll have a chance to encounter. Wait until you meet Prince Meriwether! You’ll also get to spend some time at a fairy ball and meet Queen Mab herself. And then there is that whole business with Jocelyn’s fairy wish—but oh, I’m afraid saying more would spoil it for you. 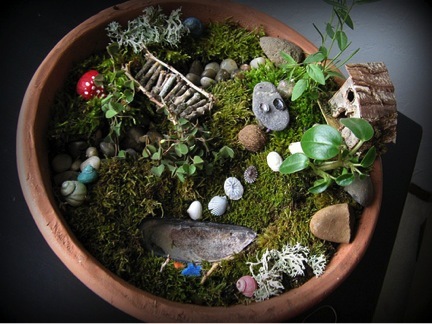 Instead, why don’t I show you how to build a fairy garden? Who knows, perhaps you’ll attract a fairy of your very own. Find a suitable container. 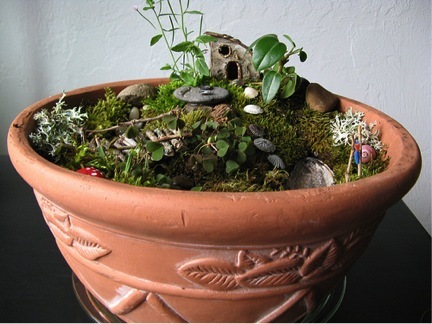 Use a clay pot, planter, sand bucket, or even a ceramic bowl. Think about whether you will want this for indoor or outdoor use and plan according. Fill your container with potting soil, but don’t just make it flat and level. Spend some time adding variety to your landscape. We chose to make a hill and a dry creek bed in ours. If your dirt resists sculpting because it is too dry and powdery, a few sprays with a spray bottle of water will make things easier. If you have made a creek bed, line it with small pebbles. Likewise for any stone paths you may wish to have. Cover all remaining dirt with ground cover. We live in Oregon, so moss was an easy choice for us. It can be found abundantly around our yard. 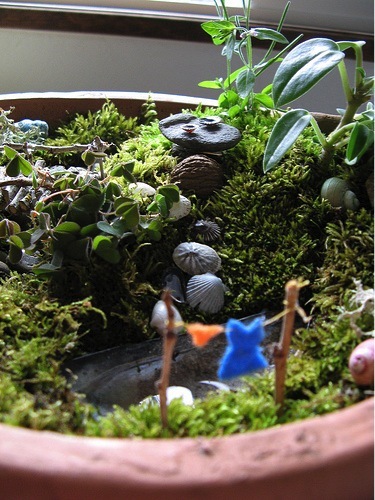 If you live in a moss-free zone, perhaps use bark dust, sand, or purchased peet moss. Accessorize! This is the fun part. Look around your yard. What natural materials could you incorporate? We made a stone table with tiny shell dishes, walnut shell and pebble stools, and a shell pond. A bit of red and white paint turned a small rock into a mushroom. Hot glue transformed some twigs into a bridge. The scene is rounded out by a miniature wash line (created from felt, string, and a pair of slender sticks) and a tiny house (purchased for $1.00 at a local craft store). I’m certain a fairy moved right into our little garden and she was so enamored with it, she completely forgot to bring in the washing. If you happen to make one of your own, I’d love to see it. Tweet me a picture @HeidiSchulz or tag me on Instagram @HeidiSchulzBooks. And if you do happen to attract a fairy of your own, warn your loved ones to watch out. You never know what kinds of things a jealous fairy may do! Thanks again! I really appreciate you hosting me! 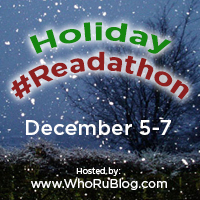 Note from Liza: Hey, Heidi & awesome readers. It’s truly my pleasure to feature HOOK’S REVENGE on this blog. On a personal note, I’ve had the pleasure of meeting Heidi and spending time with her in person. You don’t meet sweet, creative, warm, friendly, vivacious, fun, interesting, bright women like her every day. Not surprising, then, that Heidi wrote such an imaginative, clever MG debut novel. Congrats, Heidi! Thank you to Disney for providing an ARC of Hook’s Revenge! Thank you to Hannah McBride of The Irish Banana Review for arranging this blog tour with Disney! Take a beloved children’s classic story & continue the tale? Not an easy feat. But then do it exceptionally well, and you get HOOK’S REVENGE by Heidi Schulz. WOW! This isn’t just a MG novel, this is a novel the entire family can enjoy. 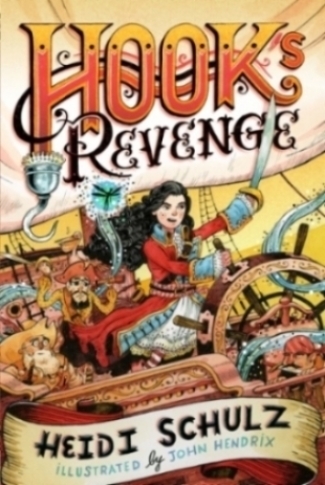 Clever and imaginative, Captain Hook and Peter Pan’s story continues in HOOK”S REVENGE! There’s adventure, danger, fun, humor, friendship, family, magic, and of course, the crocodile! Once again, journey into Neverland. 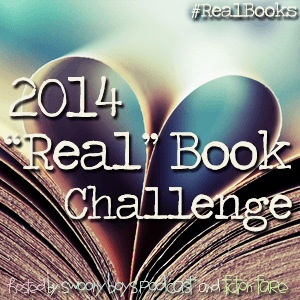 Meet fairies, pirates, and lost boys. Meet Captain Hook’s daughter Joselyn, and go on her quest to slay the crocodile that took her father’s life. Meet her best friend Roger, the horrible girls in her finishing school and Miss Eliza Crumb-Biddlecom, the head mistress. Life isn’t so good for Joselyn, but she manages to get away. That’s when the true adventure begins. Hook’s Revenge can very well turn into a classic along with its original counterpart, PETER PAN. Boys will love the action, girls will appreciate the strong female character. It’s a fantasy work you’re want to read over and over again. Def. Smee! He cracks me up!